Art and activism are not necessarily enjoined, nor is advocacy for a cause, a natural corollary of artistic practice. And photographer and installation artist Leena Kejriwal, whose latest work of public art M.I.S.S.I.N.G, deals with the burning issue of missing girls insists she is no activist either. She quips, "I am only being human." Like any other artist, she moved towards concerns gradually. To begin with, the Kolkata-based artist just did citycentric photography. 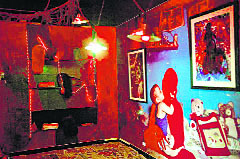 She even came up with a bestselling book Calcutta: Repossessing the City on Kolkata’s lesser-known nooks and crevices. Since she wanted her book to be different from umpteen books done on Kolkata which are mostly in black and white, she opted for colour. Furthermore, since most books on Kolkata include images of beggars and, of course, Mother Teresa, she decided to take a detour and found herself en route another path. Rather when she brought alive the essence of colonial Kolkata and juxtaposed it with the contemporary city, she rediscovered the City of Joy not only for readers but herself too. Tracing it from Chitteshwari in the north to Kalighat in the south, Kali temples became an integral part of it as well. While she has several other books like In the Shadows: Unknown Craftsmen of Bengal and Flurys of Calcutta: The Cake that Walked to her credit from 2010 onwards massive photographic installations became her signature. What made her move towards installations when photography itself is an eloquent and three-dimensional medium? Firstly, she doesn’t consider herself a photographer out to capture moments frozen in time. Instead she says, "I am interested in multiple journeys, multiple moments". In fact, the moment the realisation dawned on her that she didn’t care to hang pictures on the walls, she began to re-transform museum spaces. Slowly more and more elements began to add up leading to massive works. Like for her exhibition on red-light area, she even added a prostitute’s room with a high bed, posters and all, in the centre of the work. Then, at one point a visit into a small village near Kolkata which only makes wigs became her muse. As she found it impossible to shake off surreal visuals of wig heads, she used the imagery to voice her concern about several issues. More recently, however she has started simplifying her language. She reasons, "My earlier works were over-laden, replete with many layers. But, in public art where my viewer is a common man, I have to be more communicative." Thus M.I.S.S.I.N.G. has huge silhouettes of adolescent girls, an extension of her new vocabulary. She painted the iron and steel cutouts black to underline how these girls are like black holes lost to the world. Girl trafficking is an area in which she has been working for a long time, lending her creative impulses to NGOs. Only today she thinks public art is the best way to draw attention towards the sad plight of millions of girls on the lowest rung of the ladder. She rues, "They are nobody’s babies let down by their own families who don’t care even when their daughters disappear." As her concern transformed into a full-fledged campaign to be kickstarted in Mumbai and taken to other cities, luckily, she got support from the JSW Foundation of Sangeeta Jindal for her project. 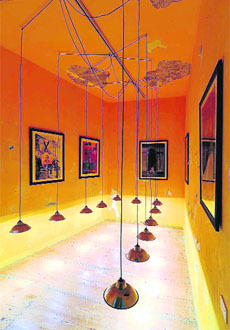 Public art in India, she asserts, is a much ignored realm with no funding for it. In France where she did a residency some years ago, she gained insight into the dynamics and co-relation of art in public spaces. Moreover, she draws a line between public art and art in public space. She reasons, "Putting any random sculpture in public domain doesn’t make it public art. Take Anish Kapoor’s works. People want to stop and spend time with it. Then, there are pieces that evoke curiosity. Like these, public art has to be specially commissioned and designed." 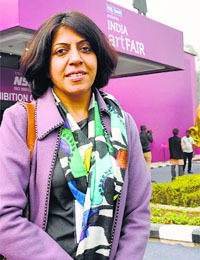 She wants to devote her energies to public art that would leave viewers with an emotive thought. Why does she feel so strongly about gender concerns? Apart from the fact that she is a woman she can’t really say what was the catalyst? Perhaps, the fact that the Kolkata’s red light area Sonagachi was not very far from her home or maybe she heard a scream in her childhood days or heard tales about young girls, she can’t pinpoint a definite reason. Suffice it to say today, her heart is in her art and in her cause. No wonder, the two meet in unison as her works throb with emotion as well as artistic energy.